President Donald Trump delivers remarks before signing an executive order at the White House on Thursday, Oct. 12, 2017. 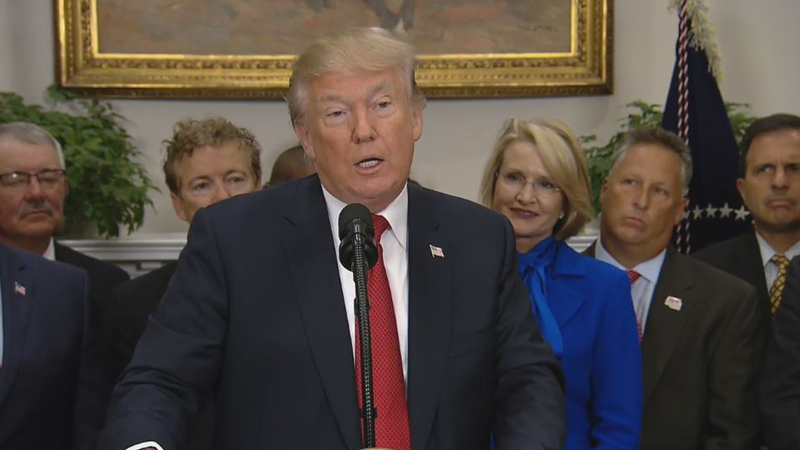 WASHINGTON -- Frustrated by failures in Congress, President Donald Trump is moving to put his own stamp on health care with an executive order Thursday that aims to make lower-premium plans more widely available. Why it would take so long: The proposals have to go through the federal government's rule-making process, which involves public notice and comment, and that can take time. Administration officials one of the main ideas is to ease the way for groups and associations of employers to sponsor coverage that can be marketed across the land. That reflects Trump's longstanding belief that interstate competition will lead to lower premiums for consumers who buy their own health insurance policies, as well as for small businesses. -Easing current restrictions on short-term policies that last less than a year, an option for people making a life transition, from recent college graduates to early retirees. Those policies are not subject to current federal and state rules that require standard benefits and other consumer protections. -Allowing employers to set aside pre-tax dollars so workers can use the money to buy an individual health policy. The president's move is also likely to encounter opposition from medical associations, consumer groups and perhaps even some insurers - the same coalition that so far has blocked congressional Republicans from repealing Obama's Affordable Care Act. But conservatives such as Sen. Rand Paul, R-Ky., believe the federal government has overstepped its bounds in regulating the private health insurance market. They argue that loosening federal rules would allow insurers to design plans that - although they may not cover as much - work perfectly well for many people.